This Sunday was doubtful in the diary at one point after Winchmore Hill Ground became unavailable and briefly it seemed that Octopus would host at Ally Pally. Late in the day we got the opportunity to once again visit Theydon Bois and took it up as we had not been able to fix a date with them in early season. The game started about 1:30 on a surprisingly good square given the continuing heatwave but all were wary and would consider helmets. Leo and Scott opened though in the event Scott faced first. 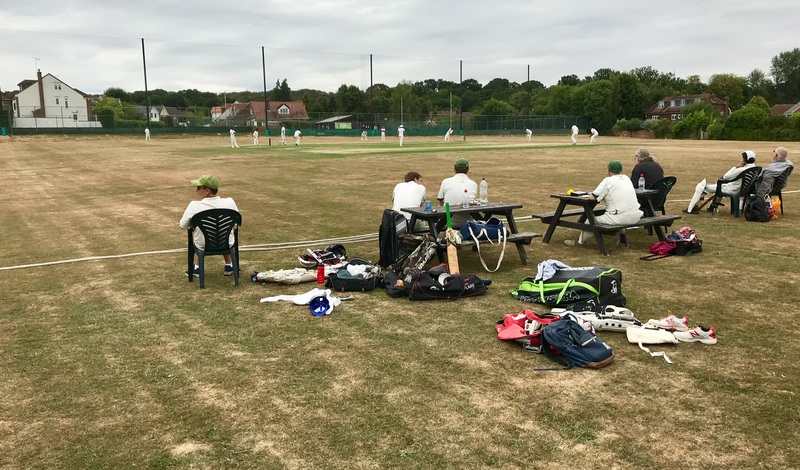 Opening to a Russ Maling Maiden was ominous but Leo first hit boundary on his third ball off Dave Shutler and both played attractive shots against a pair of bowlers who would only yield 2 wides in 13 overs. Scott had a lucky escape as a catch was dropped but it was when Leo got to actually face Russ that he was bowled in the 5th over. Mahender came in next and you could see by his approach that he wanted another high score but Russ got his second Maiden (only ones of Bois) and kept our rate contained despite Scott having three boundaries before bowled in 10th by Dave, handing the baton to Mendis who soon powered 4 boundaries against new bowling from left spinner Hussein Spall. Some of these boundaries ended up in hedges and there was never much urgency to find but you could rely on whenever Stuart picked up his bat and said let’s go and help, the ball would be discovered. It was off Spall and after six boundaries including one that dropped inches short of the rope that Mahender was caught by the other current bowler Nasir at Fly Slip for a healthy 28 after the ball bounced unexpectedly as he prepared to strike. It was good to have a scoring presence alongside most of the match which left enough time to also keep the electronic scoreboard up to date. 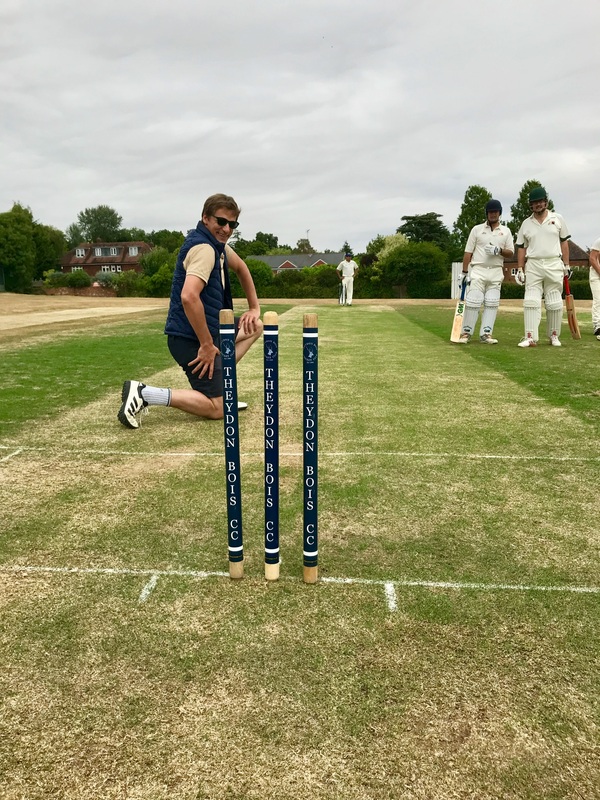 However having multiple heads can lead to multiple interpretations and when players are filling in as Umpire, without the luxury of regular walkie talkie end of over clarification such as we had in Luso, the matchraces on and the finer points are not thoroughly debated until Stuart later brings in to question. Here, a momentary confusion between byes reaching a boundary and a boundary when wide called meant that only 4 runs credited. (Twice in our batting) When question arises initially, the instant advice of Chairman is easily accepted and as the game is continuing, one convention is followed. Stuart was right though, but this scenario is not illustrated clearly in Tom Smith’s invaluable guide and it needs the precise wording of Law 22:6,7 (has been Law 25 before) to be certain that a penalty of one run shall be awarded instantly on the call of Wide Ball……and shall be in addition to any other runs scored, any boundary allowance and any other runs awarded for penalties…… all runs resulting from a Wide shall be debated against the bowler. Easy after the event, till next time! 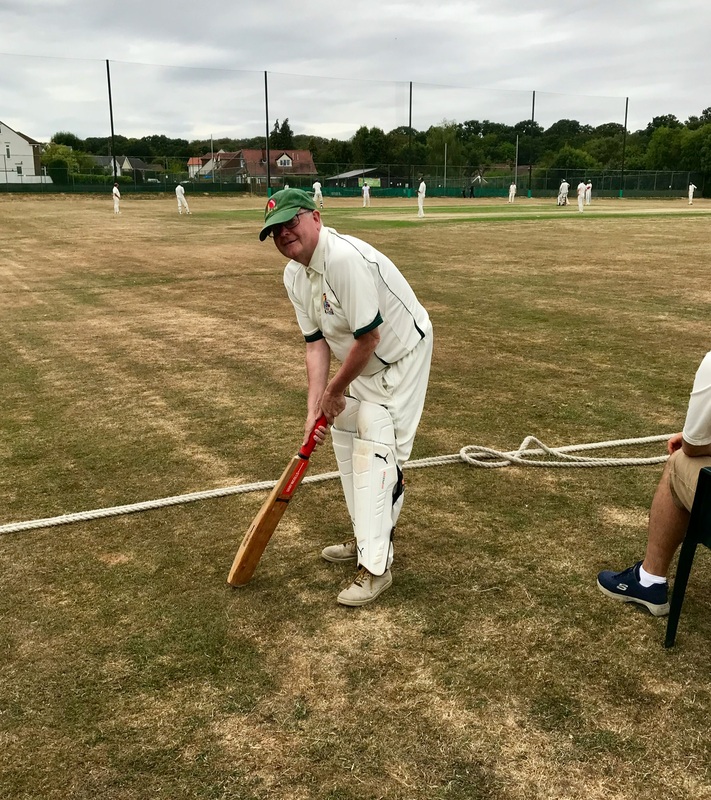 Gerry, their scorer in first half, their players mucking in during their innings, has a grandson, still only 15, playing and Dom Small was effective as wicketkeeper soon taking Stuart behind at the end of that same over off Spall. Later in the match he took a nasty impact on his instep but no one else appreciated his footballer reaction. Newton was now in and his relaxed style suggested a long innings but Small was there again to catch Mendis for 18 just as we approached drinks at 17 of 35 overs and 78/5 was not too inspiring. On resumption we had a new partnership of Newton and Manish both all rounders and were right to have confidence as they called plays well to bump up the run rate. As they reached 49 together Newton was unusually LBW off Jack Ewing but his 25 has made a difference. Manish is now on 20. Jonners makes his way in and out soon after being bowled in a second spell from Dave. Manish meanwhile has upped to 37. Our number 9 goes in, Arshad, who only got to bowl one ball before the downpour at the Regents Park T20 and I had to put on whites and box in case required. 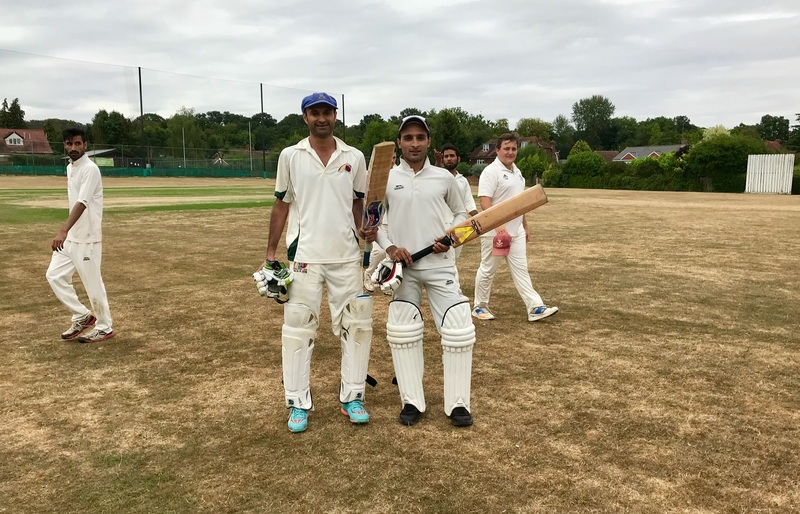 There was no urgency as Manish and Arshad bonded to lift the game to levels we have become accustomed with a splendid 70 partnership in which Arshad swiftly accumulated 37 while Manish reached 54. The ball was played everywhere and Manish had tallied his 50 in only 39 balls. If Arshad had not been bowled by Captain Tariq, his strike rate was superior. The game was far more comfortable now at 215/8 or was that really 217 as we discussed the finer points of boundary wides! There were 10 balls planned as Ronnie went in so I applied pads just in case but was pleased that Manish at 60 and Ronnie with 6, a 4 on first ball, closed our innings at 227 (229) in the 35 overs. Tea is always a good spread here and I am told the mini eclairs were a delight. The weather did not seem as oppressive as forecast with high cloud but sunburn remained a risk. 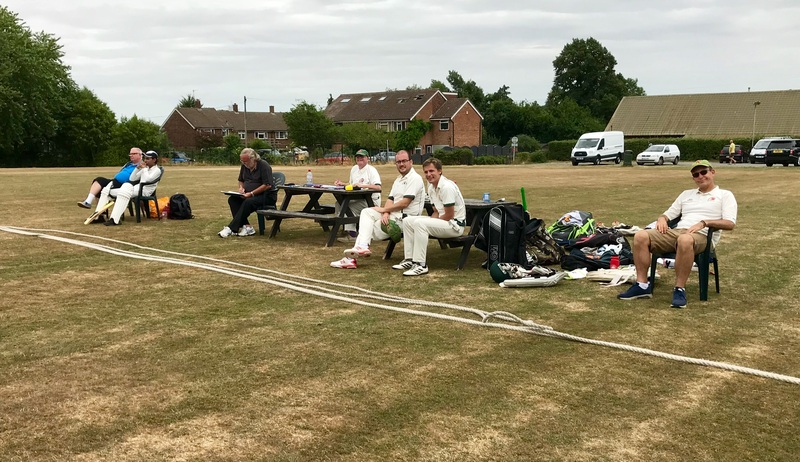 The bowling rate of Theydon was definitely unhurried and so it was after 5 before resumption. Newton and Arshad opened bowling against McCausland and Clarke and Clarke was gone for 3 in the third off Newton who snaked into middle stump. Dom Small was even briefer getting two before his first decent strike went into the hard working hands of Stuart at Deep Backward Point in Arshad’s second over. An almost identical catch but with more movement to be in place saw off McCausland for 9 in the next over. Swiftly followed next over by Ewing being LBW according to Makin off Arshad without score. 20 for 4 in 6 was not the response they wanted. Ahmed Tariq (Captain) had to force a change and started a statesman innings soon altering our prospects and although Faisal has been merely defending he suddenly upped a gear with consecutive fours and soon after the first six of the match over to Deep Cover, admittedly a shorter boundary. 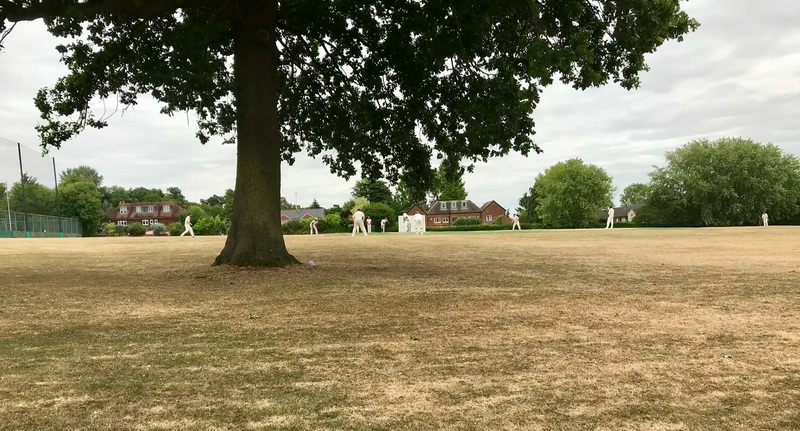 Manish put an end by bowling him at 22 but that partnership of 68 gave hope to Theydon and this was not diminished as Mo Tariq, brother of Ahmed came in and they both made a slick pair. In fact after a while they became quite audacious going forward to balls from Mendis, Mahender and Manish and for a time the over by over comparison showed a prospect of tight finish. This partnership was ended by Stuart with another firm catch this time at Deep Square Leg off Mendis and Ahmed went for 76. With eight overs remaining there was 77 required and you could sense their hope. Spall tried to settle but in Ronnie’s second over was run out by Ronnie as he foolishly went for an extra run that was never there. Talking of run outs, there was an earlier direct hit from Mendis which if video reviewed might not have been as generous as the umpire to Ahmed, which in itself was atoning for another run out chance foiled by standing in front of and not behind the wicket when the ball was sent on. In the same over Ronnie also bowled and Mahender took a good catch at deep Midwicket to remove the thorn of Mo Tariq for 47. Russ Makin and Narez played out the innings with gusto, Russ getting two swift boundaries and running a four as well and there was still some hope of getting 21 out of a last over, especially if no ball extras appeared. They didn’t and the final margin was 15 (17) runs in our favour. A match that kept excitement through twists and turns and enjoyed by all. It was good to have Jeremy, Simon, Matthew, Mamun and Sam along for support. Manish rightly got his first man of the match of this season for 60*, a wicket and the two Maidens of our innings, but knew he was pushed hard by Arshad, all rounder, Newton 25 and 3 wickets, and the reliable 3 catches of Stuart which sent the message that we were definitely playing to win. 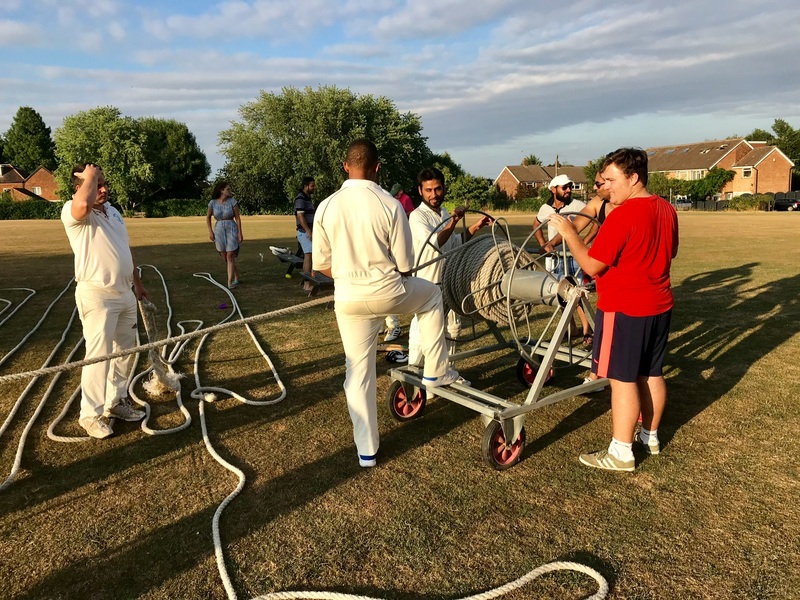 Jugs were quaffed to finish and as Skipper pointed out we have had a marvellous June and July, not finished yet as there is the two day match at Roehampton this week then we host Southland at Winchmore Hill next Sunday.